We appreciate your feedback about your support experience with WooCommerce, developers of Stripe. This helps us maintain high standards on the WooMarketplace, and helps WooCommerce improve. A valid SSL certificate is required to ensure your customer credit card details are safe, however, this plugin also uses Stripe JS to tokenize credit card numbers to make payments keeping card data secure. Stripe now works with refunds in WooCommerce 2.2+. The Stripe plugin for WooCommerce allows you to accept payments directly on your store for web and mobile. With Stripe, customers stay on your store during checkout instead of being redirected to an externally hosted checkout page, which has been proven to lead to higher conversion rates. Stripe is a simple way to accept payments online. Stripe has no setup fees, no monthly fees, and no hidden costs. Hundreds of thousands of businesses—ranging from startups to Fortune 500 companies—rely on Stripe’s software tools to securely accept payments and expand globally. Stripe is available to businesses in 32 countries. With Stripe, you can accept all major debit and credit cards from customers in every country in 135+ currencies, as well as Apple Pay, Android Pay, and other local payment methods, like Alipay or SEPA Direct Debit. Why use the Stripe plugin? 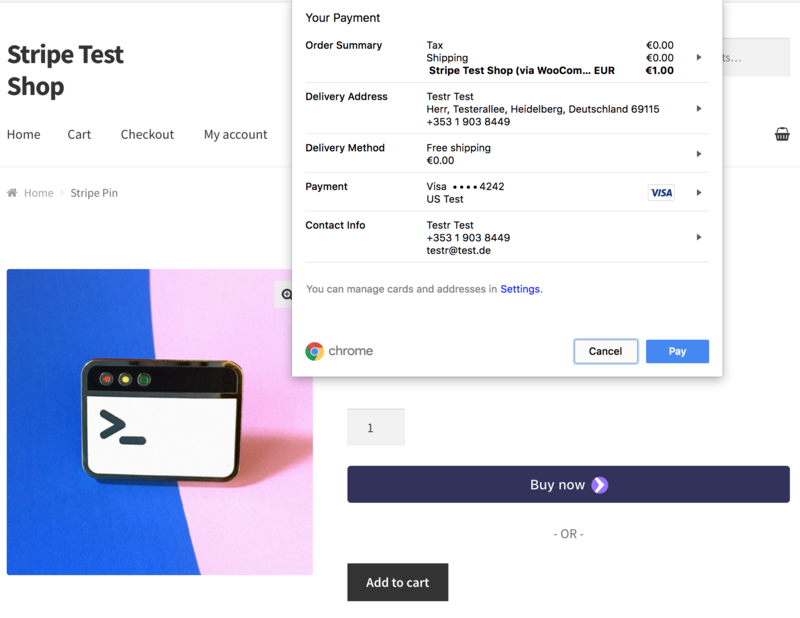 The Stripe WooCommerce plugin utilizes Stripe Elements to provide you with a PCI-compliant checkout experience that works across browsers and devices of all sizes. 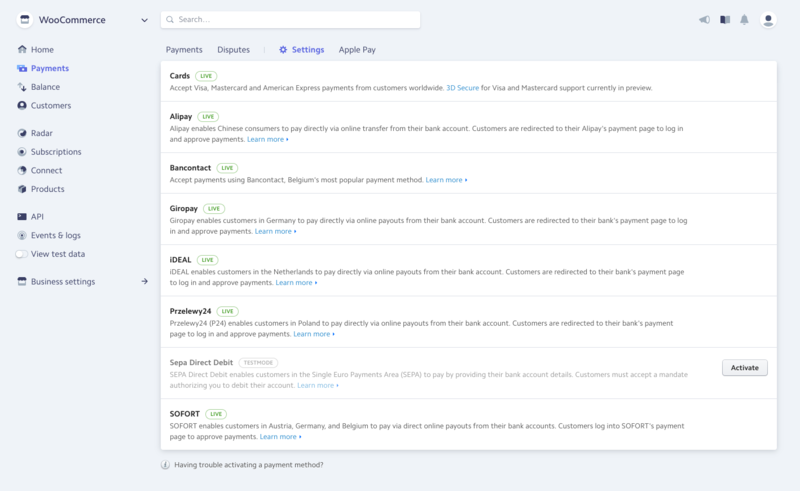 Stripe Elements is a set of Stripe hosted input fields built with the collective experience of Stripe’s front-end, design, and analytics teams and help your customers input their information quickly and correctly to minimize user error and increase the number of successful payments. Stripe Elements can be customized to perfectly fit into your theme. Stripe Elements transmits all sensitive data directly to Stripe without passing through your servers so you remain PCI-DSS compliant. Learn more about Stripe Elements. Customer preferences at the time of checkout vary drastically and supporting local payment methods can significantly increase the likelihood of conversion. With Stripe, payment methods can be easily activated from your Stripe Dashboard, no secondary contracts or additional plugins necessary. Once you’ve activated a payment method from your Stripe Dashboard, update your WooCommerce Checkout settings to list the payment method on your checkout page. Payments made with any payment method on Stripe, including cards, will show up in your Stripe Dashboard, which makes reporting and unified payouts easy. Check out Stripe’s guide to payment methods to discover and select the right payment methods for your customers. 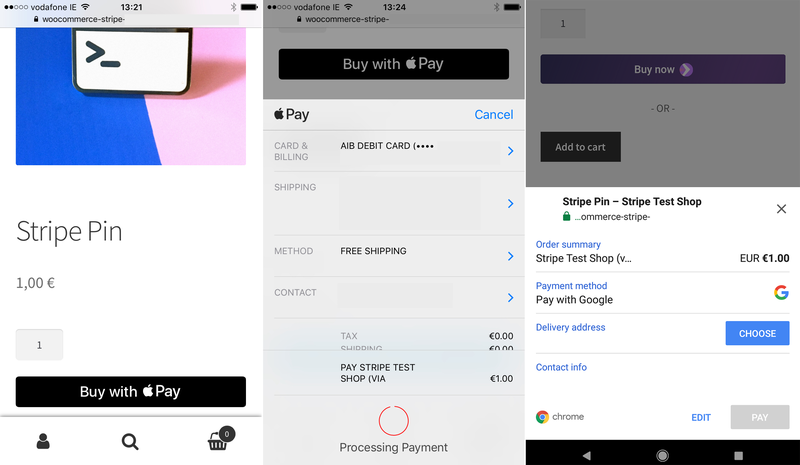 The WooCommerce Stripe plugin comes with built-in support for Apple Pay, Google Pay and the Payment Request API to speed up checkout for your customers on desktop and mobile. Fast Checkout on mobile devices with Apple Pay and Google Pay. The Payment Request API is a browser standard that Stripe and a selected group of industry leaders are developing in cooperation with the World Wide Web Consortium (W3C). The Web Payments Working Group is aiming to help make the payment experience on desktop and mobile faster and more convenient for everyone and with that increase the share of purchases that are being completed on mobile devices. 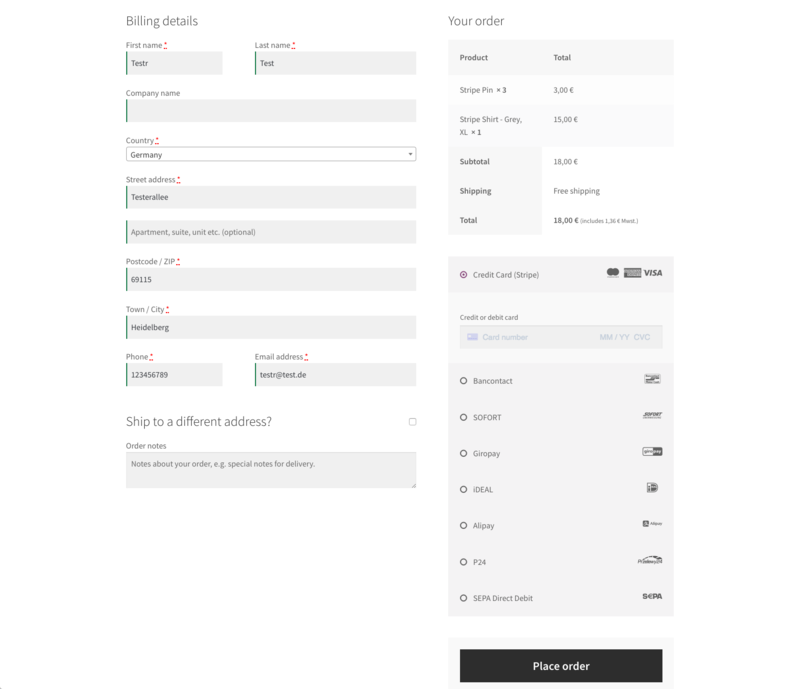 The WooCommerce Stripe plugin utilizes the Stripe Payment Request Button to support fast checkout experiences right from the product detail and cart pages. Stripe offers advanced machine learning fraud protection tools that help you detect and prevent fraud with Stripe Radar. You can enable CVV and AVS (address verification) as well as custom fraud detection rules right from your Stripe Dashboard. Learn more about Stripe Radar. In addition, the plugin gives you the option to require 3D Secure (also known as Verified by Visa and Mastercard Secure) for all card payments. 3D Secure adds an additional layer of fraud protection and provides a liability shift for certain types of chargebacks. You can enable 3D Secure in your WooCommerce settings. Learn more about 3D Secure. Use your Stripe Dashboard to see, manage, and action all your Stripe data and account balances. Stripe’s interface is fast, exposes everything from bank transfers to HTTP request logs, and provides instant type-ahead search over all your data. It’s also the one central place to track your fees and payouts. Monthly report: Gives you a useful overview of your account’s activity—grouped by month—up to the most recent full day. Payout report: Gives you payout details which shows all the charges/refunds/adjustments that are linked to a specific payout. Transaction-level balance breakdown: Gives you a line-by-line activity outline that shows your Stripe balance. Setup is easy and with automatic installation, you don’t need to deal with a file transfer or leave your web browser. To get started, log in to your WordPress dashboard, navigate to the Plugins menu and click “Add New”. In the search field, type “WooCommerce Stripe Payment Gateway” and click “Search Plugins”. Once you’ve found the plugin you can view details and install it by clicking “Install Now”. 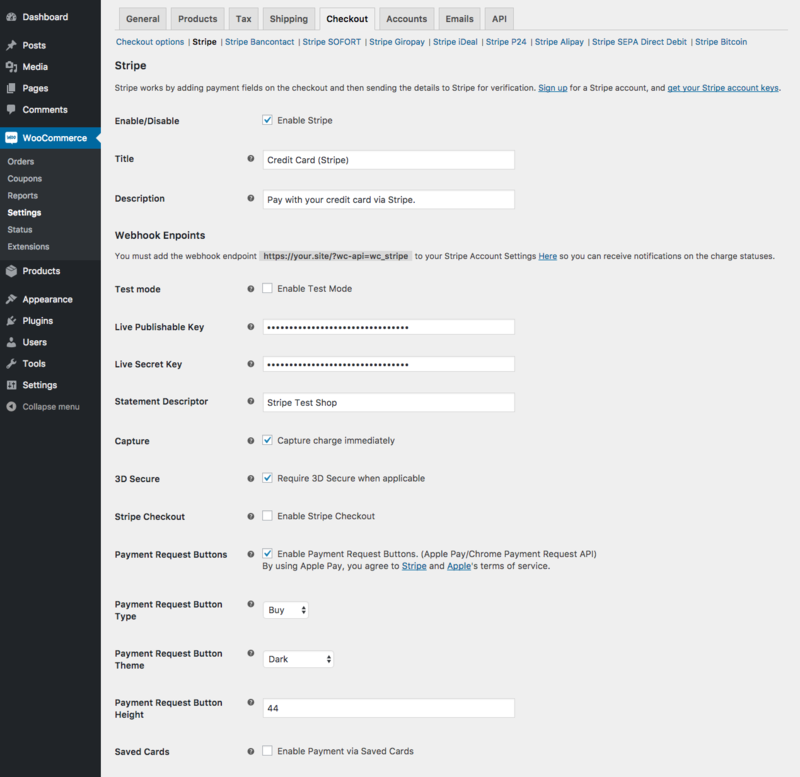 After installing and activating the plugin, navigate to your WooCommerce Settings and select the Checkout tab. Here you can activate payment methods and modify settings for capture, mobile checkout, and 3D Secure. You will also be prompted to setup webhooks to ensure Stripe can communicate with your WooCommerce installation. Get free support and updates.